A delegation of the government of the Democratic Republic of Congo (DRC) negotiate with Ituri militia groups on the disarmament of combatants and their integration in the government armed forces (FARDC). Photo credit: Martine Perret / United Nations. Report Review: Women’s Leadership and Participation in the Peace, Security and Cooperation Framework for the Democratic Republic of the Congo and the Great Lakes Region: Achievements, Challenges, and Opportunities by Niamh Reilly and Roslyn Warren. This was a report on a joint study done by the Centre for Global Women’s Studies, NUI Galway, and the Georgetown Institute for Women, Peace and Security, Washington, DC. July 2014. The growth of militarism is quite evident in the Democratic Republic of the Congo where armed groups and the government are locked in a perpetual state of war. Women and children are suffering the most as demonstrated by the countless cases of sexual violence and child soldiers. In hopes of ending systemic violence in the DRC, eleven African countries and four international organizations signed the Peace, Security and Cooperation Framework for the Democratic Republic of the Congo and the Great Lakes Region (PSC Framework) on February 24, 2013. The PSC Framework itself does not specifically focus on women; it outlines national, regional, and international commitments to help end violence in the DRC. However, the report reviews the first year of the ongoing implementation of the PSC Framework, while focusing on women and gender issues. It thoroughly analyzes the gains, obstacles, and future opportunities in each of the three fields. Part III of the report is worthy of a special note. It explores the views of key female leaders in the Congolese civil society regarding the national implementation of the three key PSC Framework commitment areas: Security Sector Reform, Consolidation of State Authority, and Economic and Social Development. Thus far, the focus of the initiatives stemming from the Framework has mainly been on security sector reform (SSR) and consolidation of state authority. The respondents agreed that the focus on these priorities is well-placed. In regards to SSR, they believe that the most urgent aspect is striving to achieve well-functioning and responsible defence and police forces. This is emphasis is understandable since much of sexual violence against women is committed by state’s forces. Therefore, they believe that an appropriate amount of funds should be allocated for SSR in order to achieve effective security and defence sectors that will be able to regain the population’s trust. 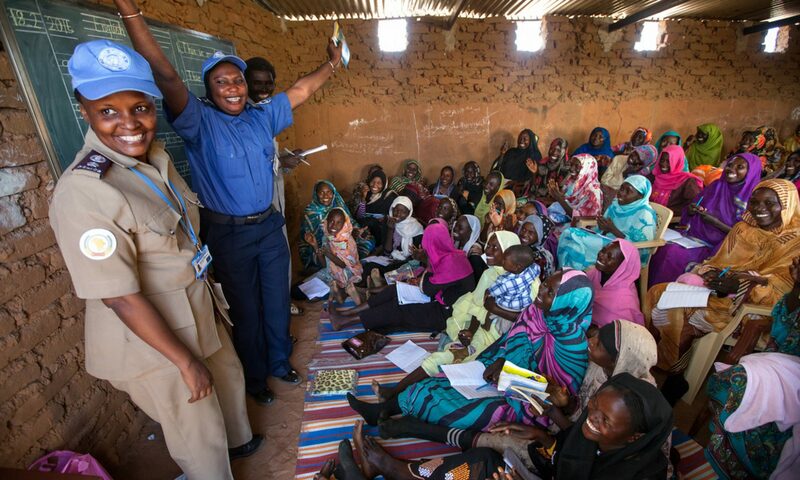 Furthermore, they emphasized the importance of the disarmament, demobilization, rehabilitation, resettlement and reintegration for establishing a more secure environment for women (and everyone else) and the importance of consistently applying existing national laws against sexual and gender-based violence. Lastly, the lack of women in the officer ranks and higher leadership positions was cited as a major obstacle to ensuring that SSR benefits women. In regards to the consolidation of state authority, the participants viewed it as a multidimensional and comprehensive process. Consolidation must be done both within the country, by ensuring an effective public administration and a monopoly on the use of force, and outside it – by maintaining good relations with the neighbouring countries. The women expressed concern that current consolidation efforts of state’s authority do not properly take into account the needs of women and exclude them from the decision-making process. Furthermore, they are concerned that cases of sexual violence are not properly dealt with, and perpetrators go unpunished. Lastly, in regards to building sustainable development and peace, the women agreed that economic development is essential for peace and vice versa. Unfortunately, they are left skeptical of the government’s commitment to these issues. Indeed, one participant stated that many Congolese people believe that “state authorities want the country’s conditions to remain chaotic and insecure [in order] to remain in power … [and] to gain more money.” Thus it comes as no surprise that none of the leaders were aware of any concrete development initiatives on the ground that arose from the national implementation of the PSC Framework. Considering that the high unemployment often leads to criminal activity, homelessness, and juvenile delinquency (all of which contribute to insecurity), it is surprising that the DRC government ranks economic and social development last in a list of six priority areas in the national implementation of the PSC Framework. In conclusion, the report demonstrates that women leaders from civil society should be included in the decision-making process as they definitely have a unique perspective on the initiatives undertaken and their impact on women. Margaryta Yakovenko is a recent graduate from the Graduate School of Public and International Affairs at the University of Ottawa. She specializes in peacebuilding, conflict resolution, and security sector reform. She is currently interning with Women, Peace and Security Network – Canada. Previous PostPrevious #16Days: A Time to Challenge Militarism and End Gender-Based Violence – In Canada and Around the World!